That's why I immediately took a trip to the shady areas of the internet and secured a trainer for Guerrilla when I picked up the game for the PC. Trainers are magical programs that mess with the memory addresses your game uses. If your game stores how much gold you have in a particular memory address, for example, a trainer can sneak its hand into that drawer and tack a few zeros onto the end of your in-game bank balance. It can even mess with the part of the game that decides how big explosions are or how fast time passes. A trainer can make a game very easy - but it can also make a game very different. Guerrilla, if you haven't played it, starts with the most effective tutorial ever. After a dreary boilerplate intro, I'm holding a sledgehammer, and in front of me there is a wall. 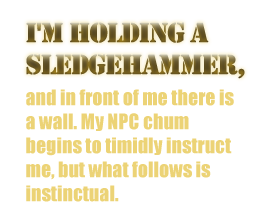 My NPC chum begins to timidly instruct me, but what follows is instinctual. I click the mouse. Alec Mason swings the hammer, and it connects in a shower of bricks and girders. My companion urges me to move through the cramped hole I've made, to press on to our next objective. Instead, I plant my feet and keep swinging. Five minutes of gaming glee later, the wall is just a cloud of dust without so much as a brick to its name. Still, the NPC chatters on at me. It's now perfectly clear that this game will attempt to tell its bland story at every turn. The character beside me is a traitor to the cause; he wears the uniform of the Red Faction, but he's a slave to Volition's misguided instincts. It was important that I give Guerrilla a fair trial, though. I dutifully play through the missions, hiding behind cover and using the oh-so-familiar assault rifle to lay down suppressing fire in extended skirmishes with the tyrannical EDF forces. To the game's credit, the missions are varied, and a select subset are pure and simple demolition challenges. Sadly, far too few of the early struggles involve smashing things. Eventually, that innocuous file in my downloads folder is starting to look like the only way I can liberate this game. Alec Mason looks the same as he does every day, but today his plans are different. I mash the F9 key, and suddenly Alec is rich. I move him into the upgrade shack and buy everything - particularly, I upgrade his ability to place mines, from three or four at once up to a dozen. I hop into a jeep and press F4 - imperceptibly, the jeep becomes invincible. I put the right half of my truck on a ramp and inch up it until it tilts, then hop out again and place all 12 of my remote mines on the rear underside of the jeep. Then, I set out for the nearest EDF encampment.